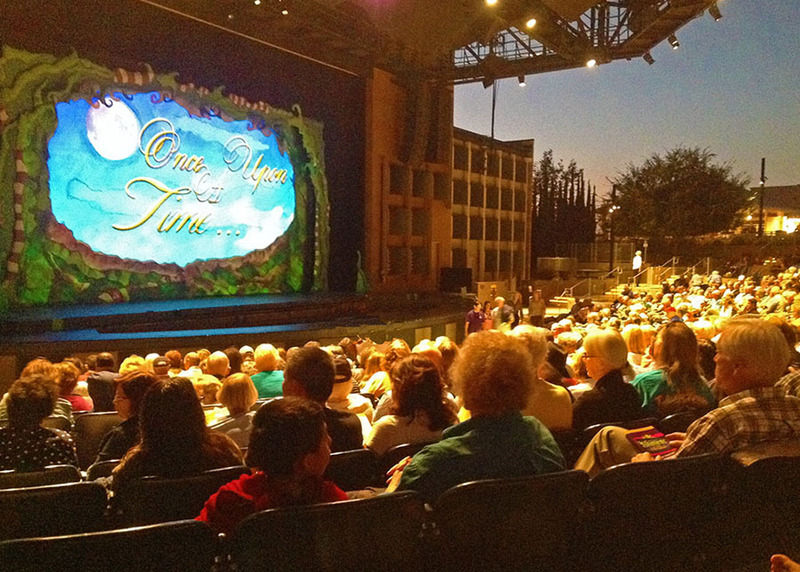 This week we take you to the Moonlight Theater in Vista, California. I was reading a question on the Moonlight Theaters web page and it asked, “ Is it a good place to bring a date?” I had to laugh because I thought, “Heck yeah it is a great place to take a date!! !” Unlike the movies, you are sitting outside and in most cases on a warm summer night. You will be under the stars and get to see the oranges and reds of the sunset as it sets just beyond the stage. You can bring your favorite food or your dates favorite food and set it up with a table and wine, then enjoy a romantic meal before the stage production begins. However, don’t forget you’ll have plenty of neighbors close by so don’t get too romantic. 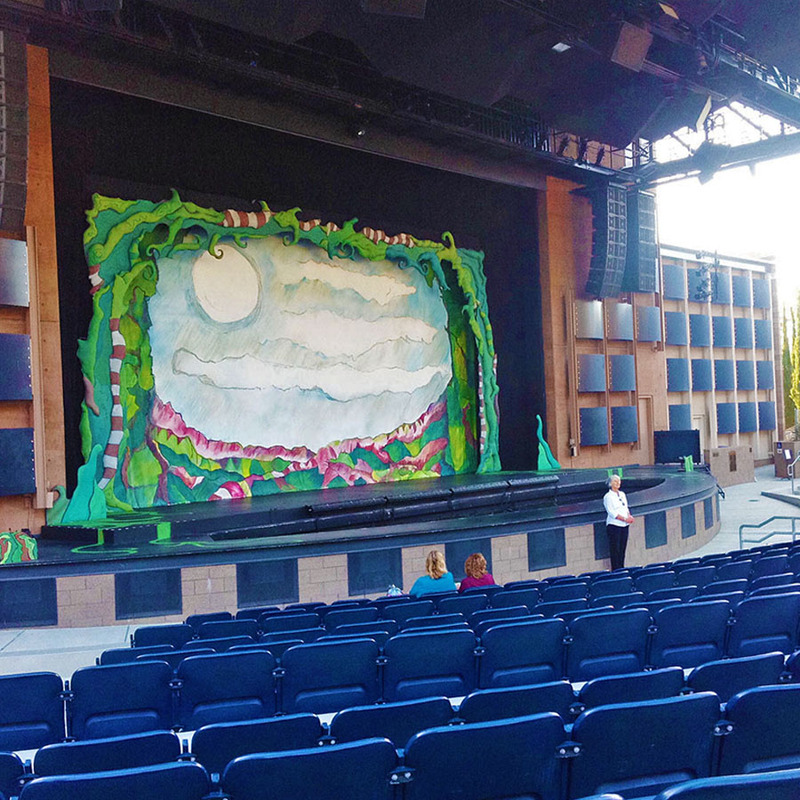 The Moonlight Theater is an outdoor venue that is known for having some of the most professional Broadway caliber shows. 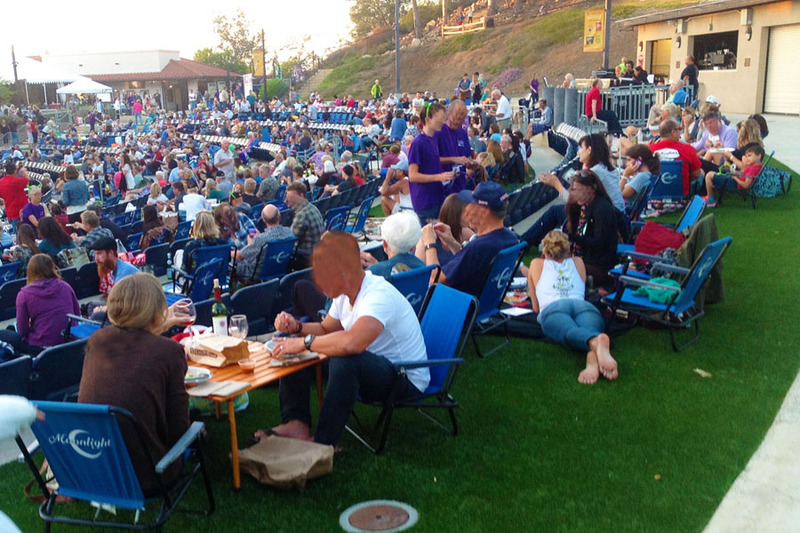 The venue offers reserved seating with actual stationary chairs but a lot of people prefer sitting on the grass that is adjacent to the seating area or on the hillside just beyond. 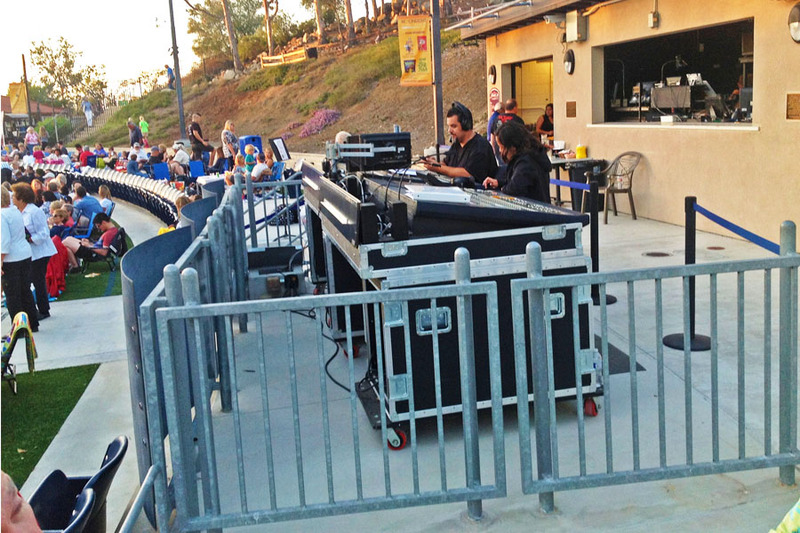 The hillside seating offers a state-of-the-art sound system so you hear the whole musical clearly. The grass area on each side of the reserved seating is the closest to the stage and that real estate can get snatched up by those early in line. I hear it is now artificial turf because of the water shortage but still gives you that picnic feel. It opens an hour-and-a-half early so get there to claim your space! 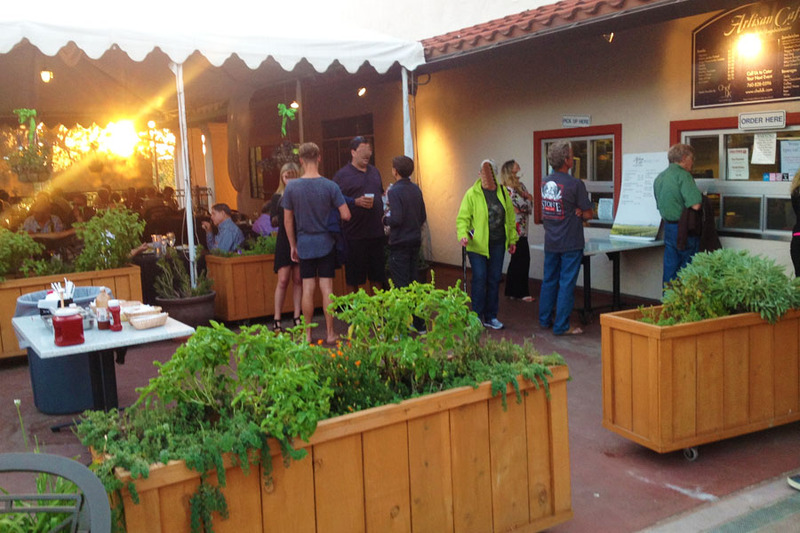 If you don’t want to bring your own food, the on-site Artisan Café sells a variety of wines and beers and has sit down seating available two hours before the show, however I would suggest reserving your seats. There are also walk up concession stands available at the venue. Low chairs are provided when you walk in the door and yes you have to give them back, but they are included in the ticket price. No, you can’t bring in your own chairs. If you grunt and groan getting out of a low beach chair, you may want to opt for their reserved seating chairs that are normal height. Beside romantic dates, it is a great gathering place for friends and family to kick back enjoy a meal, socialize, and finally enjoy a top notch musical production. You can bring everything you need except alcohol. As mentioned, that is available at the Artisan Café. Adding to a great evening and keeping the first date expenses low, they provide free parking that is available adjacent to the Amphitheater within Brengle Terrace Park. Plus they operate a free shuttle in the main grass parking lot before and after the show. I have been there many times and have never seen a bad production or had a bad seat. The production of Shrek runs through August 29th. Staycationer JoJo was lucky enough to catch it during the week and has a a few photos of the venue for us below. The show was inspired by the DreamWorks animated film, “Shrek”, which featured the green-skinned ogre that we have all come to love. This show has all sorts of characters, spectacular stage and lighting effects, levitations, a huge fire breathing dragon operated by 4 stage hands and of course the music and the actors. The actors are all either professional regional actors or Broadway artists. Each production also is accompanied by a live orchestra. So if you are on a first date or married 50 years, the Moonlight Theater gets you out enjoying the wonderful summer nights of California under the stars above. Oh, and a Broadway caliber production doesn’t hurt either. Previous PostPrevious The Golden Hour in California. Next PostNext Lions Tigers & Bears, Oh My!